ASHTON, W. Va. — If host Hannan had the option, it probably would’ve been to better defend the option. 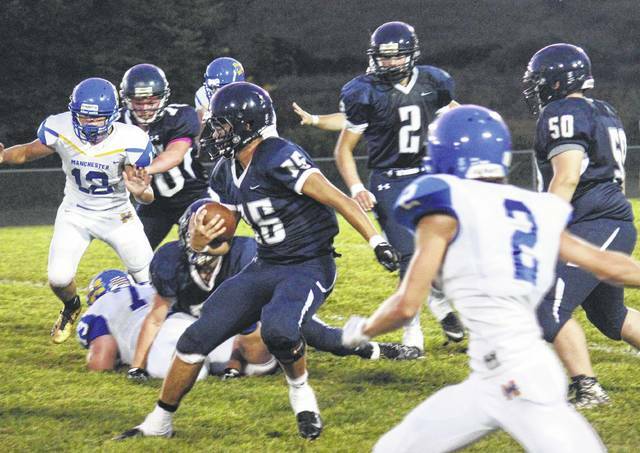 That’s because the visiting Manchester Greyhounds, in successfully executing the run-pass option attack on Friday night, gained 271 rushing yards and six touchdowns —en route to rolling the Wildcats 42-6 inside the Craigo Athletic Complex in Mason County. Four Greyhound backs rushed for at least 83 yards on at least eight carries, as Manchester ran almost at will with the triple-option look — including a back-breaking and game-changing 55-yard scamper only two-and-a-half minutes into the third quarter. That made it 21-6 in favor of the Greyhounds, as they then scored 21 more points on three more touchdowns and three extra-point kicks over a nine-minute span in the final period. The victory marked Manchester’s first of the season — as the Greyhounds stretched their series winning streak to two —dating back to the two teams’ last meeting five years ago. The Wildcats won the initial contest in 2011, but the Greyhounds gained a measure of revenge with the long road trip triumph a year later. On Friday, Manchester handled Hannan without four of the Wildcats’ top players, which didn’t play due to various reasons — including injury. The Greyhounds never trailed, extended their lead to 15-0 midway through the second stanza, and turned back a brief Wildcat rally with a 55-yard touchdown run only five plays into the third quarter. After Hannan’s Logan Nibert dashed for the team’s first points of the entire season — on a 70-yard touchdown run with only seven seconds to play prior to halftime — the Wildcats made things interesting with only a 15-6 deficit, and possession of the football beginning the second half. But the Wildcats turned the ball over on downs at the Manchester 45-yard-line, and Bilyeu —benefiting from a good-looking belly-option pitch play from quarterback Shaun Gould — darted down the right hash-mark to the end zone. The Greyhounds’ quick strike occurred in just 15 seconds —but suddenly Manchester chalked up a 15-point lead (21-6) that wouldn’t be threatened again. From there, Hannan had another turnover on downs — before its only punt, its second lost fumble following three plays, and finally another four-downs possession. Gould, with a 2-yard run at the 10-and-a-half minute mark of the fourth quarter, and Denny Polley — with a 1-yard plunge exactly nine minutes later — bookended the second 20-yard TD run by Nick Woolard. Trent Dryden drilled four extra-point kicks on the night, as his perfect 3-of-3 in the fourth quarter made it 42-6 with a running-clock rule for the final minute-and-a-half. Bilyeu paced the ground-oriented ‘Hounds with 104 yards on only eight carries, as Gould and Woolard wound up with 10 totes apiece, with Gould going for 86 yards and Woolard another 83. Woolard, taking an option toss to the right on the sixth snap of the game, went for 20 yards to paydirt — giving the Greyhounds a 6-0 lead at the 8:23 mark of the opening quarter. Woolard went for 13 yards and Gould another 19 earlier in the drive, as Manchester managed all the points it needed for the win just four minutes and 20 seconds later. After the two clubs exchanged their first-half lost fumbles, Hannan had the ball at its own 5-yard line. But a jet-sweep call on the first play following resulted in a loss of three, then quarterback Matt Qualls was tackled in the end zone for a safety after fumbling again. Trailing 8-0, the Wildcats did drive 10 plays to as far as the Manchester 37, but their first turnover on downs set up the Greyhounds’ next score. A pair of option calls by Gould and Woolard went for 21 and 26 yards respectively, as Gould — on 4th-down-and-13 from the Wildcat 22 —floated a pass to Polley, who ran a shallow crossing route and caught the ball in stride before scoring. That came with seven minutes and seven seconds remaining in the second, as Dryden drove home the PAT try to make it 15-0. The Greyhounds then recovered an onside kick, as Hannan had the ball only eight more plays in the final seven minutes. Nibert, with 134 first-half rushing yards, finished with a game-high 196 on 20 total carries. However, the remaining ballcarriers combined for minus-three rushing yards on 21 attempts, as Hannan had just 53 total yards in the entire second half. Qualls completed 3-of-7 passes for a mere three yards, as Manchester maintained an 18-8 advantage in first downs —and offset 13 penalties for 88 yards. Gould completed 3-of-8 passes for 56 yards, including two for 34 yards to Marcus Neely. The Wildcats, which remain winless at 0-3, travel to Hundred next Saturday at 2 p.m.
Hannan senior Logan Nibert (15) looks for running room as Manchester defenders James Arias (2) and Luke Thompson (12) converge on a tackle attempt during Friday night’s football game at Hannan High School’s Craigo Athletic Complex.